The Educational Bridge Project (EBP) was launched under the auspices of Boston University in 1997, and the first festival, "Days of St. Petersburg Conservatory at Boston University," featured two distinguished Russian composers, Boris Tishchenko and Alexander Mnatsakanyan. From 1997 until 2005 the EBP organized twelve more festivals, five "Days of Russian Culture in America" and seven "Days of American Culture in Russia ." In 2006 the EBP became an independent organization and in 2007 obtained the 501 (c) (3) status from IRS. During this time program development; i.e., production of the festivals, was suspended in order to focus on building the organization. In November 2008 we organized our 14th festival - the first as an independent not for profit entity. We were thrilled to host wonderful musicians from the Mariinsky Theater and a delegate art historian from the Hermitage Museum. In 2009 we were able to resume our schedule of two festivals per year and therefore host an even larger number of prestigious guests from Russian and American cultural institutions. St. Petersburg chamber ensemble performs music of Boston University composers at the St. Petersburg Composers' Association during the 35th International Festival, Musical Spring in St. Petersburg. Alexander Mnatsakanyan (Chairman of the Department of Composition) and Boris Tishchenko (Professor of Composition) of the St. Petersburg Conservatory, came to Boston for a series of concerts and presentations at Boston University, the Longy School of Music, the New England Conservatory, the Boston Conservatory, and Tufts University. Marjorie Merryman (Chairman of the Department of Composition and Theory at Boston University) and Edward Cohen (Professor of Music Theory and Composition at the Massachusetts Institute of Technology) went to St. Petersburg for a series of lectures on comtemporary American music and attended a concert of their music at the St. Petersburg Conservatory organized by EBP and performed by the St. Petersburg Conservatory faculty and students and gave lectures on contemporary American music. Richard Cornell (Associate Professor of Music Theory and Composition at Boston University) served as Chairman of the Jury of the Young Composers' Competition at the International Children's Music Festival in St. Petersburg and presented a paper on Composing in the Electronic Music Studio at the Composers' Union. Music of Bruce MacCombie (Dean of the School for the Arts at Boston University) and Julian Wachner (Boston University Organist and Choirmaster) was performed in St. Petersburg on two occasions: on May 16, 1999 at the Glazunov Concert Hall of the Conservatory as part of the Festival The Days of American Music at the St. Petersburg Conservatory and May 18, 1999 at the Composers House as part of the XXXV International Festival Musical Spring in St. Petersburg. Program of the May 16th concert at the Small Hall of the St. Petersburg Conservatory included: Leaden Echo, Golden Echo for Soprano and orchestra, text by Gerard Manley Hopkins, 1989; Elegy (To the Memory of Stephen Albert) for Clarinet, Violin,. Cello, Piano, 1993; Greeting (Sixty Bars for Krzysztof) for Flute, Clarinet, Piano, Violin, Cello, 1993; Reflections for String Orchestra - by Bruce MacCombie and Cycles,for Clarinet and Piano in three movements, 1997 by Julian Wachner; Program of the Chamber music concert on Tuesday, May 18 at the Composers’ House included: Greeting by Bruce MacCombie and String Quartet by Julian Wachner. Dr. Leibman traveled to St. Petersburg to coordinate the visit and promote future exchanges between the faculties of Boston University and the St. Petersburg Conservatory. Many leading figures of the St. Petersburg music community have expressed keen interest in participating in future exchanges. They include: Lydia L. Voltchek (Director of the Glazunov Concert Hall), Sergei Yevtushenko (Deputy Director of the St. Petersburg Academic Philharmonic), Dr. Michael Byalik (Professor of Musicology at the St. Petersburg Conservatory), Alexander Mnatsakanyan (Chairman of the Composition Department at the St. Petersburg Conservatory), and Dr. Tatyana S. Bershadskaya (Professor of Music Theory at the St. Petersburg Conservatory). Leibman met with Janet C. Demiray (Consul for Press and Culture at the American Consulate in St. Petersburg) who has supported the past exchanges and expressed interest in lending support to future exchanges the and Tatyana Kosmynina (Cultural Affairs Assistant) for the discussions about “The Educational Bridge Project”. In Boston: Dr. Yuri Dimitrin (Playwright and Librettist, Professor of the Theater Academy in St. Petersburg) gave a lecture, Gluck’s Opera Reform: How Did it Really Happen? to the graduate students of the Music Education department at Boston University. Vladislav Uspensky (Professor of Composition at the St. Petersburg Conservatory) visited Boston University for the premieres of The Prayer, a choral composition commissioned by Marsh Chapel of Boston University and the Trio for Piano, Violin and Cello commissioned by Dr. Terry King of the Longy School of Music. He also gave a lecture at the Boston University’s Composers’ Forum on November 2, 1999. Irina Taimanova (Professor of Opera Directing at the St. Petersburg Conservatory) gave a coaching session at the Longy School of Music. In St. Petersburg: The Contemporary Music Ensemble, ALEA III, (Boston University), traveled to St. Petersburg to take part in the XI International Music Festival Sound Ways. Theodore Antoniou (Professor of Composition and Conducting at Boston University and Music Director of the ALEA III) gave two lectures during the Festival. Dean MacCombie and Dr. Leibman, who came for the part of the Festival, met on November 20 with the administrators of the St. Petersburg Conservatory, Vladislav Chernushenko (Rector), Dmitri Tchassovitin (Vice-Rector), Alexander Pataman (Dean of International Affairs) for the discussion on the development of the artistic and educational exchanges. They also had a meeting with Paul R. Smith (Consul General of the United States of America) during which the Consul General expressed his interest in the cultural and educational exchanges between the two cities and the possibilities of working together on the project St. Petersburg 2003 which celebrates the 300th anniversary of the City of St. Petersburg. St. Petersburg composer Olga Petrova came to Boston to present her music at the Boston University School for the Arts Composers’ Forum on February 15; her cantata for Soprano, Flute, guitar and string orchestra will be performed by the ALEA III on February 19. Ms. Petrova was the first Russian woman composer to visit the School. It certainly brought some new issues to the discussions on the profession of teaching composition in the former Soviet Union and today’s Russia. Ms. Petrova has also appeared for lectures and master-classes at Boston Conservatory, Lesley College, and the Longy School of Music. St. Petersburg composer Alexander Mnatsakanyan (Chairman of the Composition Department of the St. Petersburg Conservatory) visited Boston University for a master-class in composition (February 22) and for performances of his Symphony No. 2 at the Harvard Paine Hall on February 20, String Quartets Nos. 1 and 2 on February 21 at the Longy School of Music. During the last week of May 2000, musicians from Boston University were in St. Petersburg on the trip sponsored by the Trust for Mutual Understanding. The “Boston Days in St. Petersburg” included: lectures by Marjorie Merryman, Bruce MacCombie, and Richard Cornell, a master class by Phyllis Hoffman, several recruiting sessions, and the concert of the XXXVI International Festival "Musical Spring in St. Petersburg". The business schedule contained several meetings with the Consul General of the United States of America in St. Petersburg Mr. Paul Smith and Mr. Thomas Leary, Consul for Press and Culture, as well as the Conservatory officials. Visit of fourteen representatives of the cultural institutions of St. Petersburg and Moscow, Russia. 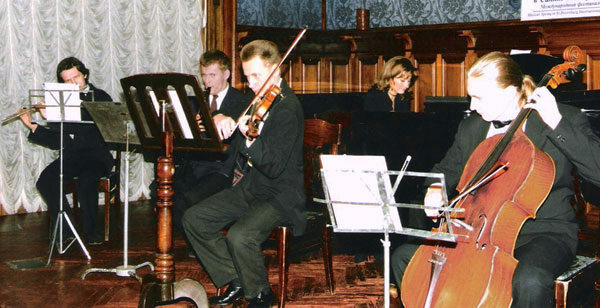 The group included five student composers from St. Petersburg Conservatory (Katherina Blinova, Svetlana Nesterova, Maria Petrenko, Anton Tanonov, and Nikolay Mazhara); Trio “Sound Ways” (composer Alexander Radvilovich, violinist Alexandra Savina, and clarinetist Arthur Lukomiansky); Piano Duo “Philharmonica” (Natalia Katonova and Dmitry Bystrov); musicologists Mikhail Bialik (St. Petersburg conservatory) and Svetlana Sigida (Moscow conservatory); a State Hermitage Museum curator Anna Konivets, and a theater art historian Marina Kornakova. “The Boston University Days in Russia” included series of concerts, lectures, and discussions. Exchange visit to St. Petersburg and Moscow of the group of Boston University School of Music, School of Visual Arts, and the University Professors Program faculty and students for the Fifth Annual Festival, “Days of Boston University in Russia”. The Festival’s events included collaborative concerts (students), lectures (Leibman, Yudkin), master-classes (Totenberg), art exhibit (D. Cornell), community meetings (Roman Totenberg), International Festival “Musical Spring in St. Petersburg” (Fussell and Schmidt.) The participants included art professor Deborah Cornell, composer Charles Fussell, violin professor emeritus Roman Totenberg, musicologist Jeremy Yudkin, music theorist Ludmilla Leibman and assistant to the VP Kevin Carleton; the students group consisted of three singers from the BU Opera Institute – David Crawford, Georgia Pickett, and Elizabeth Pizzi; string quartet Daniel Han, Zhongling Li, Mark Holloway, and Patric Owen; an art student Michelle Murillo. Two collaborative concerts brought large audiences to the CFA Concert Hall. On November 1st, 2004, the Opera Institute soloists shared the bill with the singers of the Academy of Young Singers of the Mariinsky Theater. The Moscow Conservatory New Music Ensemble concert, 50 Years After Stalin's Death: The History of Russia in Sounds, took place two weeks later, on November 16th. One of the soloists in this concert was BU professor Penelope Bitzas who performed in Symphony No. 4, Prayer, by Galina Ustvolskaya. The collaboration of the young musicians this past Fall extended beyond the concert’s practice. The Young Scholars Conference, organized and led by Marina Kornakova (St. Petersburg) and Jeremy Yudkin (Boston), took place on 10/28-10/29, 2003. Eighteen young musicologists, nine from each country, who are finishing their work on the bilingual collection of essays, discussed Collaboration and Scholarly Exchange on the first day and the Editorial Policy on the second day of the Conference. The Festival’s schedule included four master-classes: two by professor Larissa Gergieva, the Director of the Mariinsky Theater Young Singers' Academy (10/29, organized by Mark Goodrich for the voice department of the School of Music and 10/31, organized by Sharon Daniels and Bill Lumpkin for the Opera Institute) and two by the Moscow Conservatory professor Galina Shirinskaya (11/10, String Sonata master-class organized by Sheila Kibbe for the collaborative piano department and 11/13, for the String department organized by Peter Zazofsky). Professor Shirinskaya, daughter of Sergey Shirinsky, a founding member of the famous Beethoven String Quartet (Russia), gave a lecture for the string quartet class (organized by Peter Zazofsky), Beethoven String Quartet: Life of the Historical Ensemble (11/13). Two other lectures were quite different in scope: Professor Vladimir Tarnopolsky of the Moscow State Conservatory lectured at the Composers' Forum 11/19 on Timbre/Harmony/Structure in Tarnopolsky's "Cassandra" (organized by Richard Cornell); and Kind of Red: Jazz in the Soviet Union, by Zinaida Kartasheva, professor of musicology from the Moscow State University of Culture and Arts (organized by Jeremy Yudkin 11/19). The Educational Bridge Project collaborated in the Fall with a new counterpart, the Museum Program at the College of Arts and Sciences (CAS). The State Hermitage Museum art historian Anna Konivets, who is also a Director of the Hermitage-Guggenheim Project, as well as the Educational Bridge Project’s coordinator in St. Petersburg, gave a lecture, The Russian Emperor as an Art Collector: the Masterpieces of the Peter the Great in the Hermitage Collection, on November 20th (CAS Museum Studies, organized by professor Melanie Hall.) For this event, the Educational Bridge Project received additional funding from the Humanities Foundation at Boston University. Young Composers' Workshop was a new initiative taken by the Educational Bridge Project this past Fall. The format of the Workshop included two rehearsals and a final concert of compositions written by Boston University students, Ivana Lisak, Paul Wash, Mauricio Pauly-Maduro, Mark Berger, Chao Cheng, and Ramon Castillo. The scores were mailed to Moscow four weeks prior to the Workshop for the Moscow performers and conductor Igor Dronov to start while still in Russia. The final stage of the Workshop, the performance of the BU students’ compositions, took place on November 18th at the CFA concert hall and attracted the students and faculty of the composition department. The participants of the festival, Days of American Culture in Russia, included Boston University Hillel Rabbi Joseph Polak, assistant to Vice President in Public Relations and the EBP Advisor Kevin Carleton, Professor of Musicology Jeremy Yudkin, and the EBP Director, Dr. Ludmilla Leibman. Publicity event for the Educational Bridge Project: the concert of the dignitaries, prominent scholars, diplomats, and bankers from different countries on May 26, 2004, in the Hermitage Theater in St. Petersburg. Participants included Professor Mark Ptashne, a Lasker Prize recipient, from the US, as well as German diplomat and Russian banker. Pre-concert talk by the President of the St. Petersburg Composers’ Union Andrei Petrov. Organized by Anna Konivets and Dmitry Varygin from the Hermitage museum and Eduard Sorin, Executive Director of the Sol Hurok Foundation. The Course, "The Holocaust and Music", at Boston University: Goals, Expectations, Curriculum and Students' Responses"
Continuing work on preparation for the publication of the collection of essays by 18 young musicologists from St. Petersburg and Boston. Jeremy Yudkin and Marina Kornakova, chief editors, led the discussions. Concert of four generations of string quartets in honor of Professor Hillyer in the State Hermitage Museum’s Theater. Interviews with Russian journalists, Elizaveta Shtayger, Galina Kopytova, and Viktor Felitziant (subsequently published in major Russian journals). The Educational Bridge Project becomes an independent, not for profit organization, and initiates a fund-raising campaign while continuing building its capacity for future endeavors. In light of continuing collaboration with the Educational Bridge Project, Dr. Ilya Altman, co-director of The Moscow Holocaust and Education Research Center, visited Boston to discuss future collaborative programs, as well as to give a series of lectures at Boston University, Brandeis University, Harvard University, Facing History and Ourselves, and the Russian WWII Veterans’ organization. The Educational Bridge Project’s fourteenth annual Russian-American festival took place November 4-14, 2008. The festival featured representatives of the two greatest cultural and artistic institutions of Russia, the State Hermitage Museum and the Mariinsky Theater, both from the imperial city of St. Petersburg. three lectures by the Hermitage scholar Anna Konivets on the history of the world famous museum, its collections, and its new directions for the future. Winter Palace: From Katherine the Great to Present Day, Davis Center for Russian and Eurasian Studies, Harvard University. The Hermitage Today: Collections, Exhibits, Plans, at the Lynn Zabota Adult Day Care. 16th Festival took place in Boston from October 27th through November 15th. The festival featured representatives of prestigious artistic and educational institutions of St. Petersburg, the cultural capital of Russia: St. Petersburg Radio, St. Petersburg University, St. Petersburg Conservatory, as well as four librarians from the Children's Libraries of the Frunzensky District in St. Petersburg. Additionally, three young Russian musicians participated in this festival−Alexey Stadler, a cellist from St. Petersburg, Peter Lundstrem, a violinist from Moscow, and Aiman Baymuldina, a pianist from Moscow. Festival highlights include concerts of classical music performed by acclaimed St. Petersburg pianist Igor Uriash and by the three young musicians, multi-media presentations by librarians Olga Buslaeva, Yulia Kushchenko, Olga Sidorova, and Tatiana Glavatskaya, lectures by Elena Kiyko, Chief Editor of Cultural Programs at the St. Petersburg Radio, as well as a musical evening at the private residence of Dr. John Silber, President Emeritus of Boston University. The educational institutions that hosted the festivals events and participants ranged from Brookline public schools to universities such as Harvard, MIT, Tufts, Brandeis, NEC and Boston University. All programs of the Festival were free and open to the public. 15th Festival took place in St. Petersburg and Moscow in four parts: Young Composers Workshop, Concerts with Historic Commentary, Young Writers Workshops, and Young Actors Workshops. More than two hundred people participated in the Festival, and more than twenty events took place over the period of sixteen days, from May 12 to 28, 2009. In addition to our long-standing relationship with the St. Petersburg Conservatory, we established exciting new collaborations with the Moscow Pedagogical State University Choir under the direction of Maestro Alexander Soloviev, the Moscow Children’s Chorus Studio, “Joy,” under the direction of Tatyana Zhdanova, the Children’s Studio of the St. Petersburg Musical Theater “Zazerkalie” under the direction of Alexander Petrov, the St. Petersburg Theater Academy under Svetlana Ivanovna Melnikova, and the St. Petersburg “Theater of Generations” under Danila Korogodskiy. Three Concerts of the Music of Young Russian and American Composers, at the Sheremetev Palace, St. Petersburg Conservatory, and US Consulate General in St. Petersburg. Five Concerts with Historic Commentaries, at the St. Petersburg Actors’ House, Mayakovsky Library, Moscow Conservatory, the Children’s Library of the St. Petersburg, and at the Theater of the Hermitage Museum. Two Young Actors Workshops by Guila Kessous with actors of the St. Petersburg Generations Theater on scenes of the Armenian Genocide and students of the Theater Academy on situational improvisation. The Educational Bridge Project’s 17th annual Russian-American festival began in St. Petersburg on May 13th and continued through May 24th. The festival, comprised of twenty plus events, involved more than one hundred Russian participants, from a children's chorus and actor's studio to professional actors, musicians, artists and professors. Many of them have participated in previous festivals; among them were Anna Konivets, Natalia Katonova, Svetlana Nesterova, Viacheslav Kruglik, Zinaida Kartasheva, Mikhail Krutik, Elena Grigorieva, Maria Grigorieva, Igor Uryash, Tatiana Kholostova, Igor Zolotarev, and many others. While most of the festival’s events took place in St. Petersburg, some of them were in Moscow. The US participants of this year represented several cultural and educational institutions all over the country. Four of them graduated from Boston University within the last few years: Jennifer Thomas (violist), Sara Sitzer (cellist), Maura Matlak (singer, songwriter), and Daniel DeBonis (editor). Among the other participants were: Martin Goldsmith (radio commentator and author from Washington D. C.), Ivan Eubanks (editor of Pushkin Review / Пушкинский вестник, lecturer at Boston University), Guila Clara Kessous (actress, director, human rights activist), and Ludmilla Leibman (executive director, EBP). The festival's program consisted of three traditional segments: "Concerts with Historic Commentaries," Workshops and Pedagogy, and "Musical Evenings - Together Again." One of the main focal points was the celebration of the 65th anniversary of the victory over fascism. The musical compositions included in the "Concerts with Historic Commentaries" were those most representative of the era - Messiaen's "Quartet for the End of Times," songs by Kurt Weill and Bertold Brecht, Hans Krasa's children's opera Brundibar, and Soviet songs sung by Russian soldiers during World War II. Among the highlights of the festival were the evening at the U. S. Consulate General in St. Petersburg, the concert at the Hermitage Museum, a presentation at the Russian Institute of Research in the Arts (Российский Институт Истории Искусств), and student conferences at the Herzen Pedagogical Institute (Государственный Педагогический Институт им. Герцена) and the Baltic Technical University. The Educational Bridge Project’s 18th festival opened at MIT’s renowned Saarinen Chapel (10/25) with Ludmilla Leibman’s lecture on “The Nature of Musical Language” accompanied by performances on the piano (Anton Faynberg) and the samchillian, an electronic instrument (Leon Gruenbaum, creator). The next day at the MIT Center for Theoretical Physics, there opened a show of the drawings of well-known Russian artist Luba Kostenko. Later at the Harvard Club she lectured on her technique - a remarkable artist whose special interest is in illustrating musicians while they perform. A new EBP initiative –the collaboration of children from two countries - resulted in one of the festival’s most exciting events, the production of “Brundibar,” a children’s opera which was originally performed 55 times in the Terezin concentration camp during WWII. American students from the Lincoln Elementary School in Brookline and Russian kids from the prestigious “Zazerkalie” Theatre in St. Petersburg, spent a week together rehearsing, performing, and sharing after-school activities. The opera was performed at the Lincoln School (10/27 and 10/28) and at Boston University (10/29). The middle part of the festival calendar was filled with a series of “Concerts with Historic Commentaries.” These were presentations of musical events dedicated to commemorating the tragedy of the Holocaust: Jennifer Thomas presented “Different Trains,” a creative work of the American composer Steve Reich at Boston University and Brookline High School (10/28); “Bridge to America,” a panel discussion by survivors of the fascist oppression of WWII with musical accompaniment (10/29); a reflection on her family experiences under the Nazis by Rosalie Gerut called “We Are Here” (11/4); original music by Boston composers Matti Kovler and Ruth Lomon (11/3), and a deeply moving presentation at the Goethe Institute of Boston by the German Consul General Friedrich L. Loehr and the talented Moscow pianist, Jacob Katsnelson, of the music of Viktor Ullmann, victim of the Holocaust (11/1). Jacob also performed a program of Rameau, Janachek and Chopin, at Harvard University’s Lowell House (10/31) and in the intimate setting of the home of Dr John Silber, Boston University President Emeritus (10/29). A group of Russian librarians from St. Petersburg came to Boston for a second time to study the ways in which American education prepares librarians to work with elementary students. They toured the campuses of Tufts University (11/5), Boston College (11/7) spent a day in discussion with students and teachers at Simmons College known for its outstanding Libraries and Information Science Program (11/8) and then visited Brookline High School and Park School in Brookline, a private school offering perhaps the best training in library science for young students. Two other special offerings of the Educational Bridge Project’s 18th festival were several lectures at Boston University and local community centers on the “Beatles” and “Jazz in Russia” by Professor Zina Kartasheva of the Moscow University of Arts and Culture, and the opening at Boston University’s Mugar Library of a unique exhibit celebrating the 100th anniversary of the birth of prima ballerina Galina Ulanova. This exhibit was put together by the former Russian dancer, Tamara Bogdanova, now living in Boston, who had danced with the world renowned Ulanova in the 1940’s. The Educational Bridge Project's 19th annual Russian-American festival opened in St. Petersburg on May 18th highlighted by a celebration of the 100th birthday of world-famous violinist and Boston University Professor Roman Totenberg with performances of the music of Milhaud, Bernstein, Szymanowski, and Penderecki by young St. Petersburg violinists David Chakvetadze, Aleksandra Korobkina, Anastasia Subrakova and Igor Zolotarev, as well as the centennial observance of the birth of St. Petersburg’s renowned pianist and pedagogue Ella Elinson with performances by Russian pianist Igor Uryash, of Mussorgsky’s “Pictures at an Exhibition,” a cornerstone in Ella Elinson’s repertoire. Professor Claudio Veliz, a former participant of the Educational Bridge Project's festival and founder of the Conversazion, a unique forum for discussions with “no predetermined course or conclusions,” spoke on topics of Russian writers Gorkiy and Tolstoy included in the 48 years of the history of the Conversazioni. Boston University Graphic Design professor, Safoura Rafeizadeh, and two of her graduate students, Stephanie Horst and Melissa Levanti, participated in the Eco-Design Conference, “Woods and Parks,” at the St. Petersburg State Polytechnical University, as well as showed their works at Baltic State Technical University, Herzen State Pedagogical University, and St. Petersburg State University, continuing a long-standing association maintained by professors Tatiana Kholostova and Galina Sorokina. Leon Gruenbaum, New York based musician and inventor of the electronic musical instrument, “Samchillian,” participated in a concert of electronic music at the St. Petersburg Composers’ Association and demonstrated his invention at the St. Petersburg Conservatory. In Moscow Leon Gruenbaum met with the Director of the Theremin Center of Electroacoustic music at Moscow Tchaikovsky ConservatoryAndrei Smirnov and played together with Russian students at Moscow University of Arts and Culture. Leon’s hosts, Moscow jazz historian, Zinaida Kartasheva, and St. Petersburg composer Anton Tanonov had been participants in previous EBP festivals in Boston. Several festival events were held in commemoration of the Soviet Union’s entry into the Second World War. Vivian Doskow, a graduate of Boston University, spoke to young audiences of the Frunzensky District libraries on the history of the Warsaw Ghetto, its tragedy and its heroes. Several school children presented talks on Pushkin, a children’s choir sang music written on Pushkin’s poetry and Ludmilla Leibman gave a talk on “Eugene Onegin” and “Boris Gudunov.” Russian singer, Marina Tsejtlina, accompanied the talks organized by District officials, Delaida Glebovskaya, Olga Galitskaya, Olga Sidorova, and Yulia Kushenko, all of whom visited Boston for EBP festivals in years past. Bret Werb, musicologist at Washington’s Holocaust Museum, spoke on, The Genesis and Fate of “We Will Never Die,”the large-scale touring propaganda “pageant” created in 1943 by Hollywood screenwriter Ben Hecht, Broadway composer Kurt Weill, and Zionist activist Peter Bergson. His talk took place at the St. Petersburg Institute of Arts Research, and was hosted by Galina Kopytova, Chief Curator of the Manuscript Library of the Institute, who lectured at Boston University in 2004. Young Israeli composer Matti Kovler, doctoral student at the New England Conservatory, who spoke on “ New Jewish music: from avant-garde to tradition” shared his thoughts on music with students and faculty of the composition departments of the St. Petersburg Conservatory. His hosts included Russian composers Alexander Radvilovich, Anton Tanonov, Ekaterina Blinova, Svetlana Nesterova and Nikolay Mazhara, all of whom had participated in EBP’s Boston festival ten years ago. Concerts of Matti Kovlers’ music were organized by Elizaveta Bukhanova in the Moscow Glinka Museum of Musical Insturments and Shaliapin Museum. After hours, American and Russian musicians performed at traditional Musical Evenings, at the residency of the US Consul General in St. Petersburg, in the famous St. Petersburg Salon Irida hosted by the Chaplygin family, and at the art studio of Luba Kostenko whose exhibit in Boston last fall attracted enthusiastic attention from local artists and collectors. Well-known St. Petersburg soprano Maria Lyudko, gave a talk on Russian songs and beautifully performed them, accompanying herself on the piano. American guests enjoyed visiting the Great Philharmonic Hall to hear several concerts of the St Petersburg Philharmonic Orchestra, attended a performance of Khachaturian’s ballet “Spartacus” and applauded Monteverdi’s “Orfeo” at the St Petersburg Hermitage Museum’s Theatre and Rimsky Korsakov “the Tsar’s Bride” at the Mariinsky Theater. The boat tour of the Neva River at dusk, now a staple for the Americans visiting St Petersburg, dazzled with its imposing and sparkling views of the city. Final good-byes were celebrated at a goodbye dinner at “Teplo,” where toasts were raised to new friendships and the renewal of old friendships. The 20th festival, a major milestone in the life of the Educational Bridge Project, focused on celebrating the 150th Anniversary of the St. Petersburg Conservatory as we invited back to Boston several of the participants from previous years. Thus, the festival’s program included performances of the music of four St Petersburg composers who were in Boston ten years ago: Nikolay Mazhara (Capriccio and Impromptu for Piano solo), Svetlana Nesterova (Bazhov’s Tales - On the Departure from St. Petersburg to Boston, Fanny Etudes), Ekaterina Blinova (Three pieces for two pianos ), and Anton Tanonov. Graduate students ten years ago, in 2001, they are all now teaching at the St. Petersburg Conservatory, and where Dr. Tanonov is now Associate Dean of the Department of Composition and Conducting. In addition, seven young St. Petersburg virtuosi, who performed in Educational Bridge Project sponsored festivals in Russia and Boston in 2009, 2010 and 2011, journeyed to Boston to collaborate with young pianists and violinists from music schools of the Boston area: Veniamin Blokh (piano), David Chakvetadze (violin), Ksenya Gavrilova (piano), Alexandra Korobkina (violin), Alexey Stadler (cello), Karina Sposobina (piano), and Anastasia Subrakova (violin). Three violinists, all pupils of the famous pedagogue Saveliy Shalman, represented his school in the best possible way. The festival opened on October 25 with talks on the History of Soviet Jazz: by Zinaida Kartasheva, Chair of the jazz orchestras and ensembles department of the Moscow State University of Arts; on Shostakovich’s Eighth String Quartet …Instead I wrote a quartet, needed by nobody and ideologically sinful, by Dr. Ludmilla Leibman; The Literati of St. Petersburg: by Diana Vinkovetsky, well-known writer and essayist, and culminated with a presentation at Mugar Library, Tales of Passionate Pursuit with Daphne Kalotay, Diana Vinkovetsky, and Tatiana Yurieva. The program included musical interludes of Russian songs by the children’s ensemble “Lucky Ten,” under Alexander Prokhorov and selected classical works for violin and cello by Paganini and Bach. The ringing of the Russian Bells in the tower of Lowell House, Harvard University, invited all who came to hear An Afternoon of Classical Music: Performances by St. Petersburg musicians: Veniamin Blokh, David Chakvetadze, Ksenya Gavrilova, Alexandra Korobkina, Alexey Stadler, Karina Sposobina, and Anastasia Subrakova. Included in the program were the Sonata No. 2 for violoncello and piano in Fmajor, Op. 99, by Johannes Brahms and the Divertimento from the Fairy Kiss, by Igor Stravinsky. Very different was the music presented in the Saarinen Chapel, Massachusetts Institute of Technology. Sound Waves was a program of electronic and acoustic music by Anton Tanonov accompanied by New York soprano Zhanna Alkhazova and Boston musicians, violinist Olga Kradenova and pianist Alexandra Carlson. Boston University’s George Sherman Union hosted Little House on Pesochnaya - more of Anton Tanonov’s electronic music with a demonstration of his music for animated films. At the Berklee College of Music he collaborated with Berklee professor Ramon Castillo to present their piano and live electronic pieces, Funeral of a Voodoo Doll for piano and electronics, performed by Tanonov and Brain by Ramon Castillo performed by Veniamin Blokh and the composer. The Harvard Musical Association hosted a full length evening concert of chamber music by St. Petersburg and Boston composers:Sharing the Stage. This program included the Sonata for Violin and Piano by Boris Tishchenko, Prelude and Fugue in F sharp major by Sergei Slonimsky, Fantasy by Anton Tanonov, the Quintet for Clarinet and String Quartet by Matti Kovler, the Four Italian Songs by Tony Schemmer, and other compositions. And a few days later a second event took place at Mather House entitled Russian Poetry in Russian Music - Nuances of Meaning: a discussion of the vagaries of interpretation in translating poetry from one language to another and from one art form to another. Songs by Dmitri Shostakovich and Anton Tanonov were performed by singers Yelena Dudochkin and Zhanna Alkhazova, accompanied by pianists Tatyana Dudochkin and Alexandra Carlson. At Steinert Hall young student musicians (ages 4-16) from the Boston area took the stage in the afternoon event, Piano Music for Two hands, Four hands, and Two pianos, which offered music of Dmitri Kabalevsky, Sergei Slonimsky, Svetlana Nesterova, Ekaterina Blinova, and Anton Tanonov. A few days earlier students from the Sharon Music Academy delighted listeners with a concert of piano music,Masters and Apprentices, of St. Petersburg composers Valery Gavrilin, Sergei Slonimsky, Anton Tanonov, Svetlana Nesterova, andBoston composer Phillip Mazza. Final appearances by Anton Tanonov were made at the New England Conservatory sharing the stage with American electronic music composers John Mallia and Katarina Miljkovic of the New England Conservatory and Lou Bunk of Brandeis University and later at a Composers Seminar at the Granoff Music Center, Tufts University, hosted by John McDonald, composer and pianist who has a long-standing connection with the EBP since its first festival in the fall 1997 when professor McDonald hosted Boris Tishchenko and Alexander Mnatsakanyan.